All transactions are safe and secure with a reliable history in online purchasing behind each of our associates. Buy the Linus Munchies t-shirt to own Peanuts clothing and merchandise. Charlie Brown's best friend Linus works up quite an appetite carrying around his blanket everywhere. Here, he is curing his case of the munchies with a chocolate chip cookie. 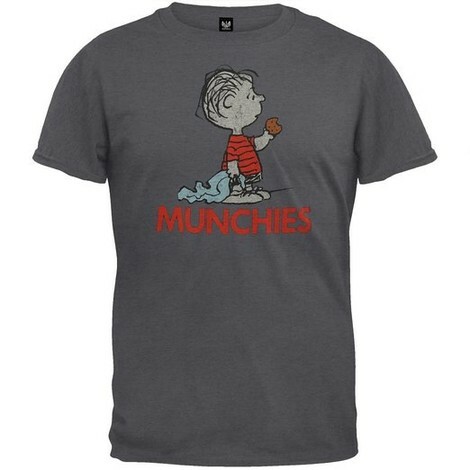 Have a cookie too and cure your own case of the munchies in this cool Peanuts Linus Munchies t-shirt. It's ideal for Linus fans or the general slacker in your life. If you'd rather represent the aspiring go-getter, choose a Charlie Brown t-shirt instead. Either is a great choice. In addition to the Linus Munchies tee above, browse the Peanuts Clothing Gallery for more apparel like men's and women's clothes, kids shirts or hoodies.